‘Rubber’ is a French comedy about a tyre (named Robert) that comes to life and goes on a killing spree, using its telekinetic powers to blow people up. A strange mix of dark comedy, horror and perplexing philosophical debate, Rubber delivers the titles proposed silliness for viewers who are prepared to wait. With a running time of 82 minutes, the film’s slow pace can be attributed to director Quentin Dupieux’s style of cinematic and genre dissection. Rubber will bewilder and confuse even the hardiest of viewers as Dupieux takes a one note joke, and stretches it beyond breaking point. In a daring effort, Dupieux takes the film’s concept (a tyre coming to life and killing people) and sees how far he can take it, in an attempt to determine if there is anything profound to be found in such a story. 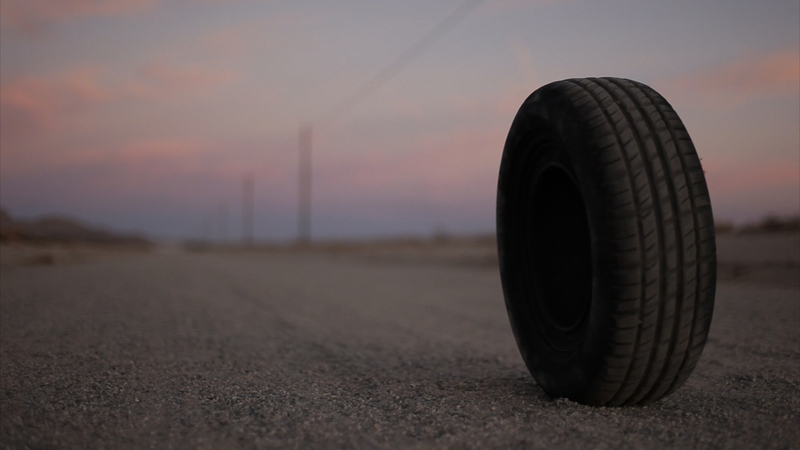 The film is divided into two parts, one of which is a traditional narrative which, as you might expect, chronicles the murderous tyre’s short life. The second focuses on a small group of people that have gathered nearby to watch and comment on the film as it unfolds. It is this second group that Dupieux uses to examine his own story and comment on it. In time, the group becomes more and more integral to the ‘actual’ film’s plot and they become entangled in the narrative, ultimately changing the films outcome. After the murderous tyre has killed several people, Lieutenant Chad (Stephen Spinella) arrives to investigate these murders. The sheriff participates in both strains of the film- he is actively involved in the narrative, but also interacts with the on looking spectators, even commenting, as they do, on the events that are taking place, Lt. Chad, along with an unnamed Accountant (Jack Plotnick), tries to thwart the progression of the story at every given opportunity, including the Accountant poisoning the majority of spectators in a bid to end the film. Once Lt. Chad realises that the film must continue, the film picks up pace in a narrative sense and a comedic one. Rubber is a mix of B-movie etiquette and ‘no reason’ philosophy (Lt. Chad explains this to be that the important events and decisions in life, and films, happen to have accrued for no reason). Rubber is a unique and absurdist take on the horror genre, a genre that’s rules director Dupieux has no qualms in bending, even experimenting with the nature of the structure of cinema itself. Crucially, Rubber is an entertaining experiment that delivers both in being a silly and a smart film that, although may not be accessible for most people, is a lot of fun for the rest of us.